Cannibal Creek Speedway was a small kidney shaped track located at the base of the Black Snake Rangers where the sound of reving speedway engines would break natures silience on a monthly basis. The Creek only ran for a few years firstly as Cannibal Creek Speedway, some time later the tracks name was changed to Garfield Speedway and then the interest faded, Cannibal Creek (Garfield Speedway) was the for runner within the district to the Wattle Park Venue, Wattle Park Speedway was a nearby exzisting Speedway that was operating at the time, It was later decided to close Garfield Speedway and the club would amalgamate with the Wattle Park Speedway club and rename the venue Garfield Wattle Speedway, As time passed the speedway would go through another name change to Drouin Speedway, it is believed that the track was later used for motorcycle racing. 1963 - Russ Corrigan's twin Jawa TQ pictured in the pitts at Cannibal Creek. Photo: Bob Maltby. 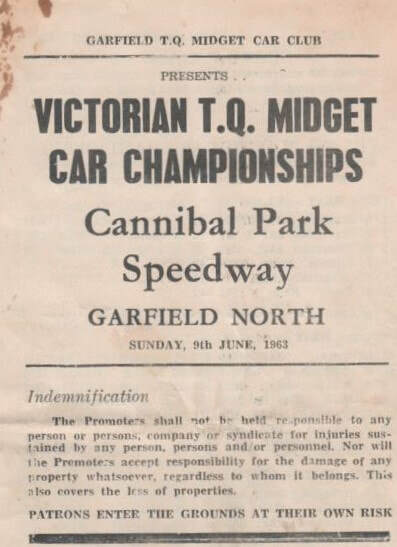 Allan Streader recalls: Cannibal Creek held an Australian Title for tq's, there were about one hundred and twenty cars in the pits, South Australia's "Lucky Foot" won the title as per usual, celebrations afterwards went long on into the night, we stood around the Bon-fire most of the night having a few quite beers while the wonderful ladies in the canteen kept the food coming, One of the ladies had been complaining about the ladies toilet, they had been complaining to the committee for some time but nothing ever got done, The drivers decided to assist the ladies in their cause, the old timber toilet had shrunk in the weather and it was said that the "p" had been deleted from privacy, piece by piece the ladies toilet ended up in the fire and the warmth was felt by one and all, The issue had been forced and the ladies got their new toilet for the next meeting. The track was the home for the Victorian Litre Saloons, these smaller sedan cars than normal such as Triumph Heralds, Ford Anglia's, Honda Scamps were seeded into two divisions, under 1,000cc and up to 1200cc. Mick Mahoney recalls: Because the track was so small and tight around its Kidney Bean shape it took a lot of skill to navigate, It was a track that you drove exceptionally well or you didn't drive it at all, This track had the ability to make good drivers look like fools. My choice of car was a Triumph Herold and Gunther Krone a Honda Civic.